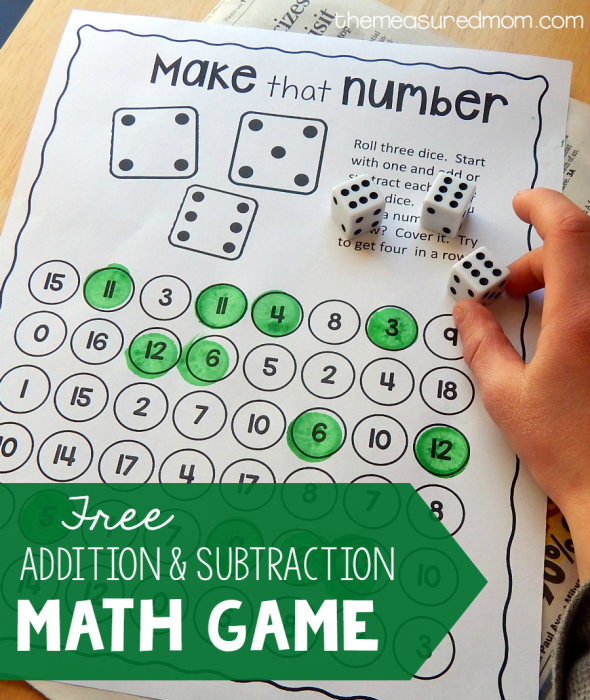 This addition and subtraction activity turns learning math facts into a game! 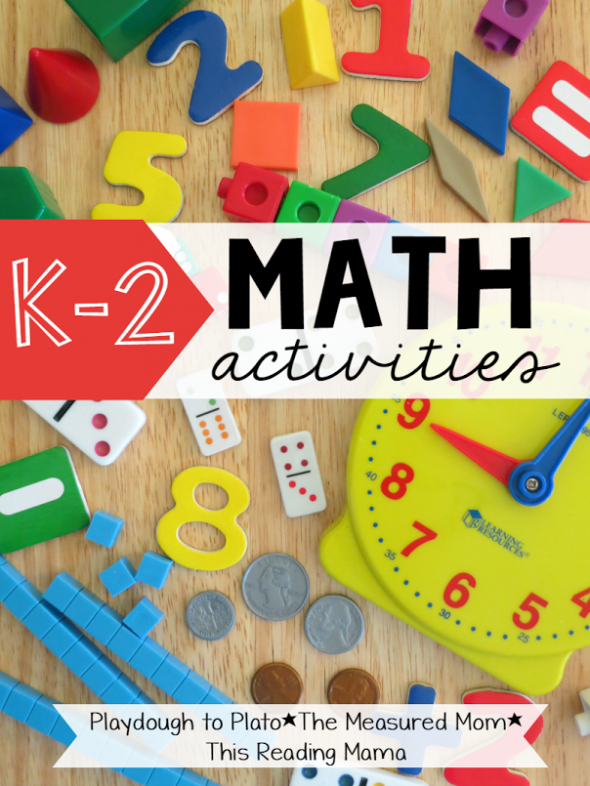 It’s week two in the K-2 Math Activities Series! I’m teaming up with two other bloggers to bring you a total of three new math activities each week! This week we’re featuring games that focus on operations. 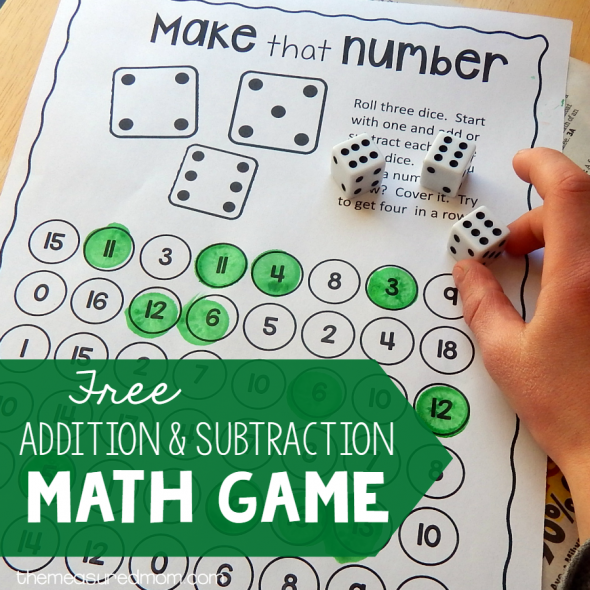 Since my game is for second graders, I created a game that will give kids a chance to practice addition and subtraction – with a little problem solving thrown in. 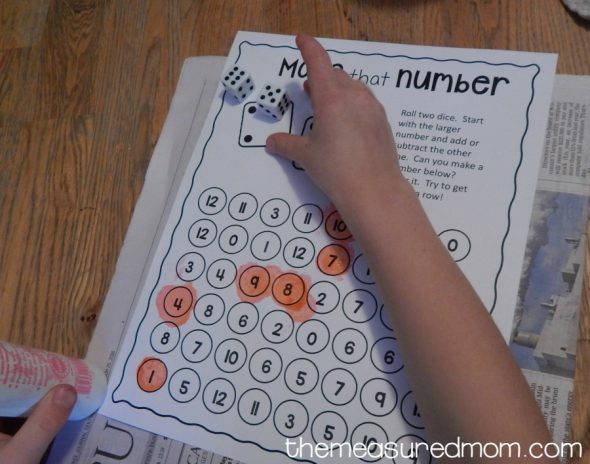 Print a game board for your child and provide the dice. We don’t have a second grader at home, so I pulled this out to use with my first grader. We started with the three dice version, since he enjoys math. Start with one number. 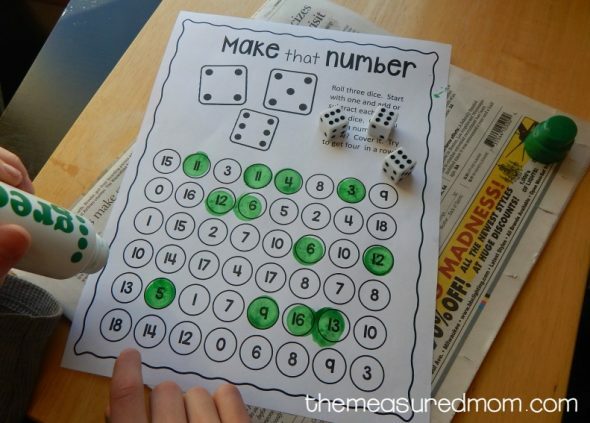 Then add or subtract the numbers on the other dice to make a new number. When you get four in a row, the game is over. In the above example, you see just some of the answers you could get with the dice labeled 6, 2, and 4. You may find that your chidl takes the easy way out (as did mine) by simply adding the dice instead of trying to mix up addition and subtraction. That works for a little while, but it probably won’t work if they are going to get 4 in a row. For some children, the three dice version may be too hard. Print the two dice version instead. Just remind them that when they subtract, they have to start with the larger number. 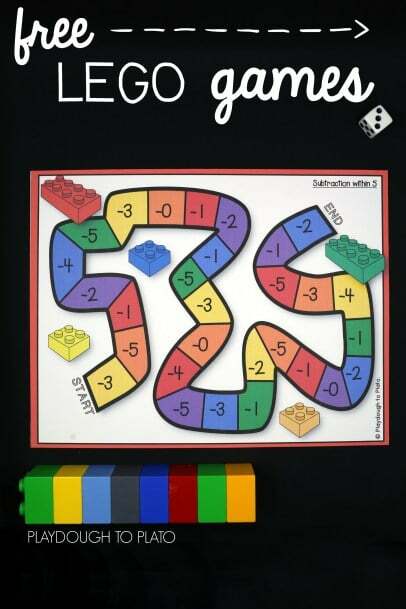 For kids who are ready for a challenge, give them the four dice version. 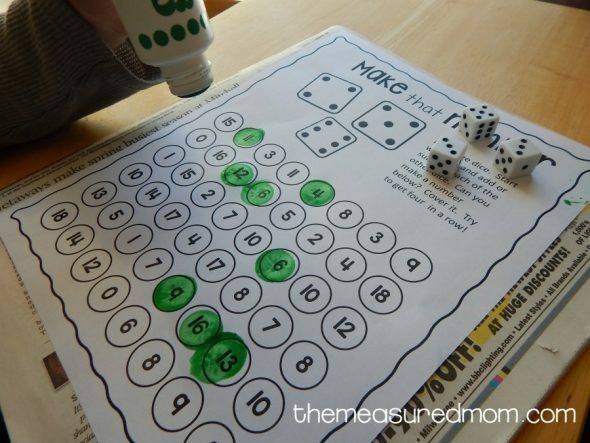 Encourage them to try to get four in a row with as few rolls of the dice as possible. 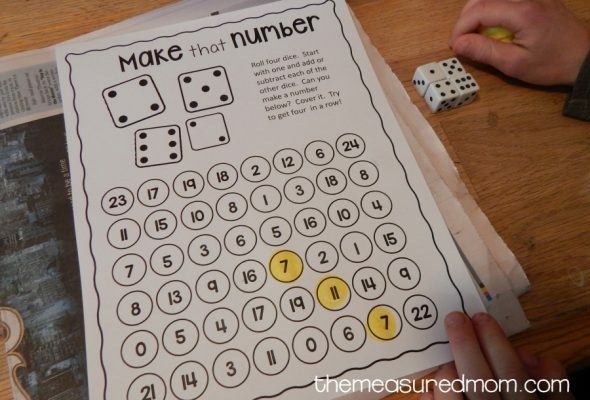 This way, instead of just adding or subtracting the dice in a random fashion, they’ll problem solve to get a particular number which is close to the ones they’ve already colored. 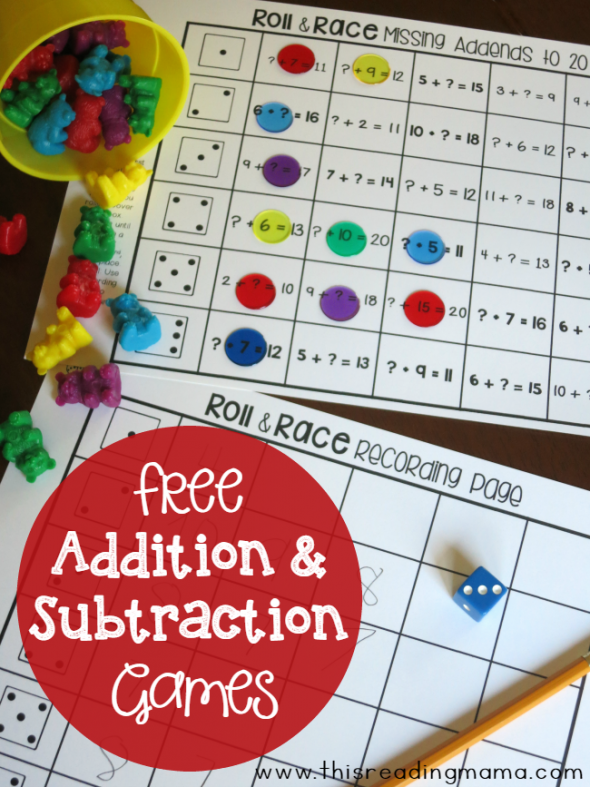 Enjoy this addition and subtraction game! Don’t miss the other new games this week! To see the whole series, click on the image below. © 2016 – 2018, Anna G. All rights reserved. Thank you for sharing all the games and activities that you create on your own time. You make a difference in many classrooms across the nation. I agree with 2 and 3 of todays blog. I’m with you. # 3 before computer’s I was in the library looking for the next interesting subject to read about. up and down the rows of books till I found something that struck me as something to study. I hate ball sports. I love to just walk and run by myself. no team, no competition. or swim. or CC ski. or snowshoe. #1 I’m not a twin but everyone thought my adopted brother and I were when we were little. 10 months apart and he is my blood line 1st cousin. I cant wait to read #4. Love the Lego Addition/Subtraction Games!!! 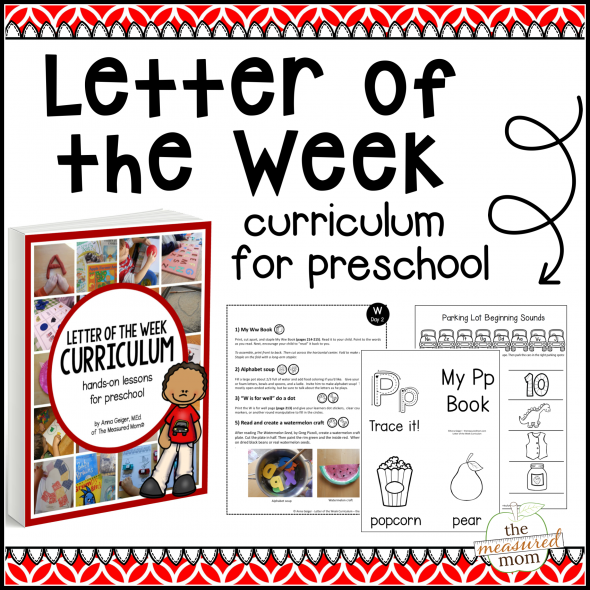 Thank you for sharing, they’re already printed and I can’t wait to use them with my class! Yay! Have fun with them, Mary! Thank you so much for all the games and activities that you have shared! My kindies really enjoy all the games too! You are so awesome to share. Thank you for this great resource. I think I may vary the directions and try it with 2 students playing on the same board. Thank you very much for sharing your useful resources. They are really a great help. I just wanted to say thank you for your great resources. I can’t wait to see how the kids enjoy the dice games. You’re very welcome, Lisa! I hope you find many helpful resources on my site. Thank you for all your wonderful free resources! My first graders love them! Thanks for the game ideas! I’m looking forward to using some of them. Just a math note – please model correct mathematical notation. I know this is how we commonly write two number sentences when we build off of the first answer but this is not mathematically correct. Thanks for pointing that out, Kathy! I had intended to write them as a sort of transcription of what would be stated aloud; but I can see that in print it doesn’t work mathematically and is actually quite confusing. I fixed it. Thank you for all the amazing resources. My kiddos love these games and it makes my first year of teaching less stressful! I am the lead teacher in a Self-Contained ESS middle school class. I also have 2 gen ed students come in for math and reading to support their peers. We played this games and everyone loved it! It was time for a class change and I wrote my gen ed students a note so that we could the game haha! It was a huge hit! I can’t thank you enough for your kindness. I just can’t believe how much you give to others. You have truly helped me in the classroom and I appreciate your generosity. Thank you! Great game! I’ve adapted this for my third graders to include all 4 operations as options. I’ve also created a recording sheet to keep them accountable. Thank you!